Tyler enters his first season with the Bravehearts. He is from Pembroke, MA and has earned his bachelor's degree in Business Administration from Worcester State University. 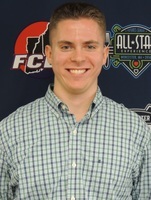 Tyler works as a graduate assistant for the Department of Athletics at Worcester State while looking to earn his master's in Management this May. He has always had a passion for sports, espcially baseball. He handles programs such as the Kids Club and Reading Program, and looks to provide new ideas as well as a hardworking attitude to the team.